"Very handy for transportation and storage"
"Use it to protect the table he cooks on. Great product. KaTom had the cheapest price on the Web. Believe me I checked!!!" "only use the bag a couple times but they seem sturdy. I I think the zipper may end up being its weakest point have to wait and see." "I pack my Dutch Ovens away so wanted to do the same with the cook table I bought to cook on. When breaking camp, its nice to have a bag with no ash on the outside to easily carry the table to the truck and know there will be no ash on it to transfer to other equipement." 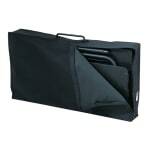 "Helps keep other gear and the car cleaner while transporting the cook table"